I will confess to being basically ignorant of Slowdive until this year, so I cribbed the following background details from Wikipedia: Slowdive formed in 1989, and became associated with the shoegaze genre. Having released several records over 20 years ago, including 1994’s revered Souvlaki, they went on hiatus in 1995 and the members worked on other projects. Then, in 2014, to everyone’s amazement and delight, they announced that they had reformed, and began touring. 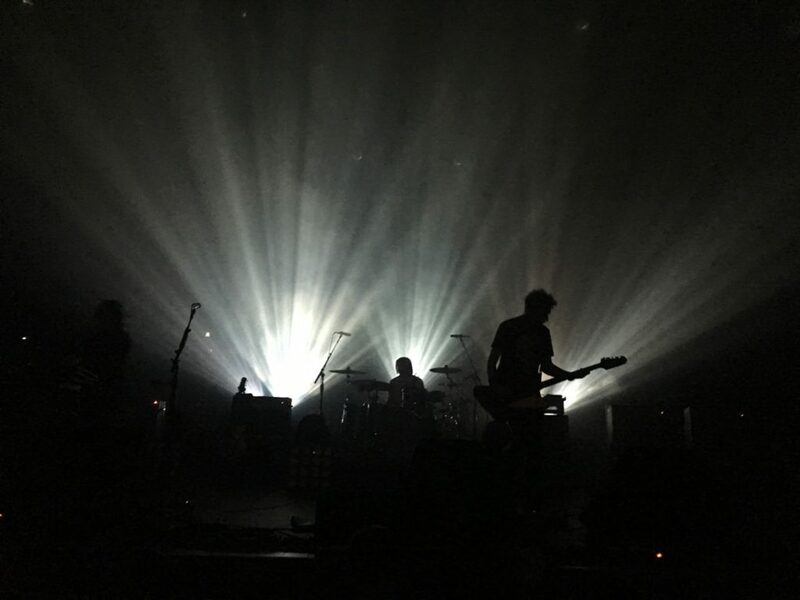 They released the first new Slowdive album in over 20 years in March, and have been touring in support of it. 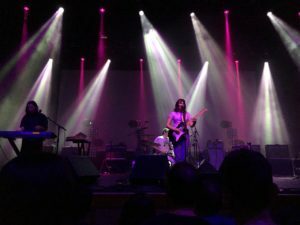 My first impression of Slowdive when they took the stage last night at Oakland’s Fox Theatre was that time has been very kind to them. They looked great, and like they were really enjoying themselves. We were quite close to the stage, between singer and instrumentalist Rachel Goswell and bassist Nick Chaplin. Rachel Goswell has a beautiful smile, which she flashed us continuously as she sang, played and swayed to the music. Nick has the rugged good looks of a Dolce and Gabbana model, with his low-slung Gibson Thunderbird and cat-like moves. The other band members were not quite as demonstrative, but I felt that they were feeling it as well. Following the evocative lyrics (from a poem by James Joyce), the band moves into a long, slowly building instrumental, which swells and crashes, with washes of distorted guitar sweeping against each other into the climax. Good stuff. I’ve actually been a fan of openers Cherry Glazerr for about a year, and they’re the reason I splurged on the tickets for this show, since I hadn’t got a chance to see them before. My son and I were discussing the contrasting musical styles of Slowdive’s soaring sonic explorations with Cherry Glazerr’s more propulsive, punkish sound. We decided they complemented each quite well. I think it could have been tedious to sit through another, possibly lesser “shoegaze” set before Slowdive – much better to be rocked by Clem Creevy and company, and then settle in to Slowdive’s transcendental grooves. Cherry Glazerr played a good selection of songs from both their records, Haxel Princess and Apocalipstick. I recall the following: Nuclear Bomb, Had Ten Dollaz, With the Guys, Only Kid on the Block, Apocalipstick, Teenage Girl, Trick or Treat Dancefloor. There were also a couple I didn’t recognize – possibly new ones. They sounded great and were very loose musically, and literally. Clem loped and bounced around the stage like a cartoon character and made funny faces. Sasami Ashworth rocked out with her synthesizers, and drummer Tabor Allen’s arms moved with octopus-like fluidity. The bassist mostly just played the bass, but he was cool, too. Of course I still want to see Cherry Glazerr headline, and play all their awesome songs. But it was a great set, and we were pretty close to the stage which was nice.